Shirdi Sai Baba Stories,Leelas and Teachings. : Shirdi Sai Baba's Grace-Experience Of Sai Devotees-Part 11. 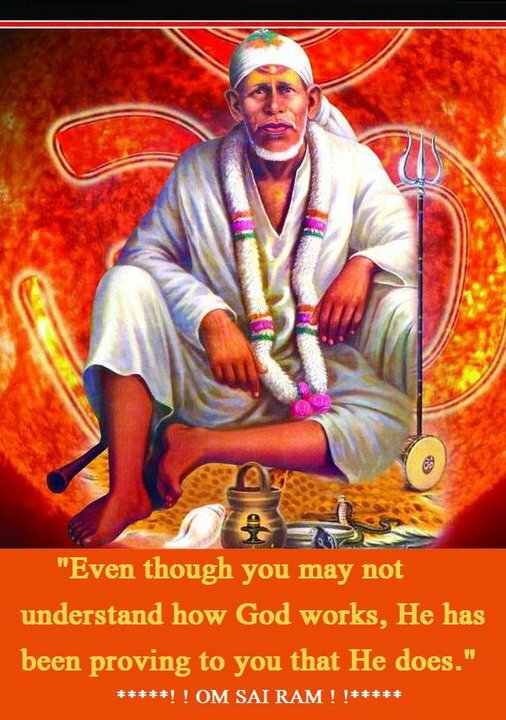 Shirdi Sai Baba's Grace-Experience Of Sai Devotees-Part 11. Every child of Baba feels Baba's presence in every moment of their life. They feel Baba's presence more strongly when they are at the cross road of life and do not find any way forward.Baba always help their children proving that He is always vigilant and taking care of His children .Here are two such experiences shared by the devotees with all of us .Jai Sai Ram . This is a wonderful incident that took place with me in Dec 2010. I am a guy, an entrepreneur, 25 years of age, currently in Bangalore but bought up in Delhi. I am a devotee of Sai since 1999, Baba Has been with me since than but there are sometimes when you feel that you are missing the connection. The Story I am narrating is one of those times when I started feeling that the link is missing & something is wrong, When you start doubting & your faith starts diminishing, Baba does something to bring you back on track in his own sweet ways & makes you feel that he was always there but it’s you who was running away. Before Writing I prayed to him that I am incapable of writing this incident, thus please write it the way you want it to be written so that your message reaches to many like me. Now I will continue with the story as it is about Sai & only Sai. I wanted to apply for German Visa. I already had US Visa & a trip to US after 4 days. I wanted to go to Germany by taking a halt as my flights were via Frankfurt. I am Based in Bangalore & to apply for a German Visa one needs to go To VFS Bangalore for Documentation Check & appointment Scheduling, after which an interview takes place in Chennai. I had my intuition that something is wrong & I will face difficulties in getting Visa or might not get at all. I went to VFS Bangalore & was asked to sit for my turn. While waiting I saw that the environment of VFS is very hostile, the supervisor was treating the Subordinates badly & was speaking very rudely. I was bit annoyed to see this. There were couple of incidents where the supervisor scolded the people badly & insulted them. With all this happenings around I had the feeling that they will do some mess up with my documents & this will result in me facing difficulties in Visa Process. When my turn came I went to the person on counter, He was a nice guy. He asked few questions to which I replied Confidently. He checked my Documents and told me that they are fine but suddenly he thought of something and went up to the supervisor to cross check. He came back to say that there is some issue with my tickets to which when I replied they got convinced & scheduled an appointment for the next day. In the night I spoke about all of this to a friend of mine who is a staunch devotee of Sai Baba & also shared my intuition, She told me that Don’t worry Baba will help you get the visa & you will meet a person who will give you his Photo as blessings. This will help you. I have been worshipping Baba since last 15 Years & always wanted to meet him this way. So I offered by prayers to Baba & asked him to meet me. In my mind had my thoughts who ever will give that photo; I won’t let him go since he will be SAI himself. Very rarely we get to see him & why will I let him go? After My Prayers I went to sleep as I had an early morning flight to Chennai. From the time I woke up to the time I reached Embassy I was extremely conscious that SAI BABA would come & give me his blessings. I kept on looking but no body came. Thus disappointed to some Extent I reached inside & waited for my turn. My turn came &; I went up to the window, there was a lady in 30’s with very good smile. She asked me some questions &; I replied. She was astonished to see the kind of work I was doing & praised us. She did checked my documents and was more impressed and I was thinking that how it can happen that everything is happening smoothly & also why did not Baba gave me his blessings. But who knew I had a big surprise in store. The lady was impressed with the documents &; everything but than suddenly something came in her mind & she consulted the seniors. Actually she found out two errors in my tickets, one was about the language of Invitation letter & the other related to Flight Tickets. Just to tell you all, for German Visa mandatory requirements are Invitation Letter, Flight Tickets, Travel Insurance & official documents from Company of applicant. Invitation Letter from a German Company stating the purpose of travel & the expense responsibilities. Confirmed flight tickets indicating the duration of stay in Germany. Insurance for intended stay with travel days included. Now the issues were, I had attached the tickets to US via Frankfurt & indicated that I intend to take a Stop Over on return, with no confirmation on Stop over from Airline. My Insurance dates were starting from midnight of the day I was reaching Germany. Thus this lead to confusion at their end. To which they suggested me to get a fresh tickets & insurance. I had an argument with them that these documents have been approved by VFS & thus should hold valid & secondly If I submit back tomorrow, I will not be able to get my passport back before my flight to US. The senior person told she can not help me & thus Visa can not be issued but the lady was suggesting me that please call your travel agent & get these things arranged & submit in VFS Chennai and you may get the Visa but I was not getting the point as I did not knew any agent who could do this for me. I always book my tickets on my own using Web Portals & it is difficult getting it changed, as January is a peak time. Disappointed I started my return to my hotel. Just when I walked 100 meters from Embassy, there came the guard running after me, he told me that someone is calling me inside, At once it reminded me of Sai baba so I ran to embassy again, I went inside but no one was there, than I came outside & asked the guard & he told me that he knows only this & asked me to wait there & later he was asked to guide me the address of VFS Chennai. Thus I returned to my hotel. Just to try I called the help desk of Web portal but they refused to help me. I spoke to the same friend & told her what has happened & how Baba did not helped me. She consoled & said nothing, While I was speaking on phone I was getting a call waiting which I ignored once as the number was unknown but than I picked up on second time keeping my friend on hold. There was a voice of a lady and she inquired if it was me who went to German embassy for Visa interview, I replied yes & she told me, Why are you worrying? It is very easy Just call the travel agent & request him to hold tickets for you & submit your documents along with new ticket in VFS & rest will be done. I asked her name but she refused. I got the hint, I blocked my tickets on Emirates, took out the printout hurriedly & left for VFS which was 2 kms from my hotel. Do you think my encounter with Baba is over? I went to VFS & showed him the documents, he told me that there is still some issues & it was missing the Demand Draft, which I recalled that might have left with the lady at embassy. I came out & called the lady who called me & told her all of this. She again with her impressive voice said ‘ Don’t Worry’, I have called the VFS head & he will take care of your case. She told me to go inside & meet the head. I went inside & asked at the counter for head. He came & he called me by name & said he knows about my case & asked me to submit my documents at the counter. Do you think that the encounter is over? He examined my documents & pointed that something wrong with my insurance. He told me that it is less by one day & you will not be issued Visa as embassy rules are very strict. I did not knew what to do. Looking at me he told me that you can submit your documents & see what happens. I though that submitting was the best option as I had very little time to get the new documents & than submit them the same day as it was already 4pm. Thus in baba’s name I decided to submit & came out. After Coming out, I spoke to my friend & told her what has just happened, she was surprised but laughed that how could I believe that Baba will not help me. She also inspired me to call that lady again & thank her. Thus I Called the number & told her that I have submitted the documents & thanked her for all this. She told me that she is the same lady at the counter & has no clue why she wanted to help me which otherwise is not allowed. Than I told her about Baba, my friend telling me about my meeting with baba & everything. She told me that she is a staunch devotee of Baba & may be Baba asked her to help me in all this as she found me good enough. I can’t describe how I felt but tears came in my eyes. I thanked her heartedly. Do you think is this still over? I also told the lady on phone the issues pointed by officer regarding insurance. She again said, “Don’t Worry, Book another ticket, take print outs submit the same to guard at the embassy gate & rest will be done” Thus I Rushed to my hotel, booked another tickets & submitted the same to the guard & came back to hotel room. I cant describe how I was feeling, It is a wonderful feeling & whenever I think of all this, I feel the same. Do you think is this over? I thanked BABA profusely & left from my hotel for Airport. I was talking to my friend & was expressing my gratitude for inspiring me for this wonderful experience. I reached Bangalore & my home & shared this experience with my partners. They were surprised too. Next day around lunch I got a call from Didi (Lady at Embassy) for telling me that I have got my Visa & should get my passport by tomorrow as the same has been dispatched. I can’t tell you the joy I had. My all fears have passed & It’s a wonderful feeling to feel the closeness to Sai Baba, who helps his devotees in different forms. Now can you say that the Didi was Sai Baba or a human, I learned one thing that Sai helps his devotees in every possible way he can. His ways are strange but that’s what leads to strong belief in the hearts of devotees. Since we want miracles to believe his presence. I am simple Sai devotee who considers baba as a friend. I kindly request you not to disclose my name and email id in the post. Sorry if my post is lengthy. My husband , myself and my daughter who is now 5 had come to the UK a year back as my husband is posted on a project here. The procedures for admitting your child to school is different . We have to call up the county office who is responsible for all the admissions of the schools in that county and register our child's name and then they will check and let us know if there is any seat available in the schools that we prefer. As we have no private transport of our own, we had to rely on public transport and walking for all local activities even if it is going to school. So I was looking for a school for my daughter which is close by to our home but to my disappointment no seats were available in those schools and also 3 months had gone by since that academic year had started and getting seats was a little difficult in the nearby good schools .So we had placed our child's name in the waiting list with the county.I was getting scared as I wanted my daughter to attend school and not waste her academic year. One of the staff of one the nearby schools called up another school ( X )and confirmed to me that there is a seat available in that school .I went to X school next day with my daughter and met one of the staff who said that my daughter's seat is confirmed .I was really happy that at last my daughter will be attending school and also in my mind thanked Baba. But Baba knows what is best for us .I found on the internet that each school had report based on the government inspection .Something told me to research about the X school. To my horror the report on the X school was not that good and there was report of bullying also.I was scared to send my daughter now as she is a kid and will not be able to handle bullying and did not know what to do as I did not want to lose on that seat for my daughter.I prayed to Sai to help me out. I did a frantic search on the internet to find out good schools which are at an OK distance if not near from the house and found out one school ( ABC ) which had a good report.In my mind I was hoping to get a seat there for my daughter but still had negative thoughts since it was a good school and the seats will be full.The following thursday I got a call from the county office and the lady on the other end enquired whether I had found any school. I told her I did but at the same time I mustered courage t! o ask that lady if seat was available in the ABC school . She checked and told me that the seat was available and that she will send fax to the ABC school to admit my daughter . I was thrilled as my daughter will be going to a good school and also when I checked the public transportation service was much better than the previous X school. Now my daughter is attending the ABC school and is happy. My koti koti pranams to baba to be my side .I am so grateful that on Thursday itself the lady had to call and confirm the seat.All this Baba's grace and he knows what's best for our family.